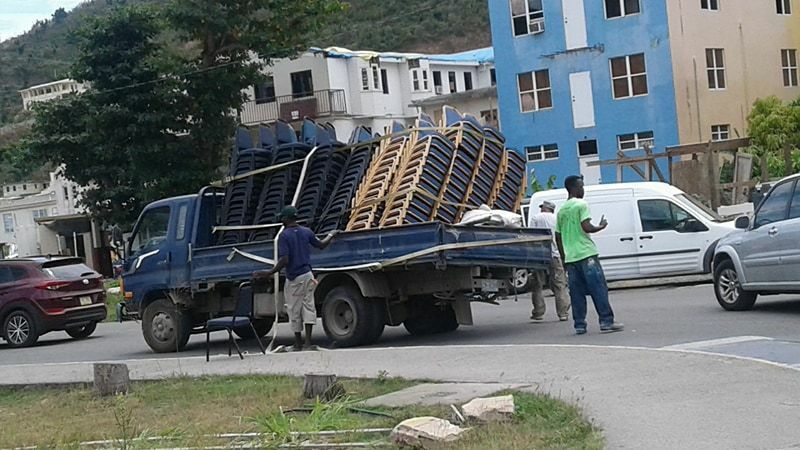 ROAD TOWN, Tortola, VI- It was a near scare for a driver and crew of a small truck today April 3, 2018 around 12 noon in Road Town when the chairs they were carrying in the tray of the truck started tipping over. 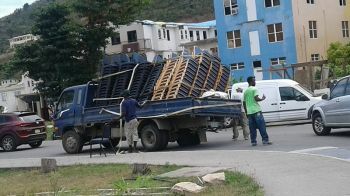 The incident happened along the road in the area of the House of Assembly on the main island of Tortola and caused traffic to divert to one lane. 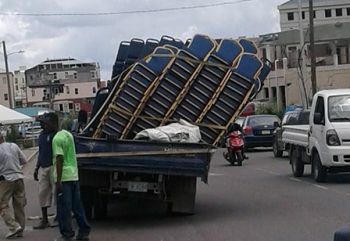 It appears that the chairs were stacked too high and too heavy for the small truck as both the chairs and the truck appeared to be leaning over. It was also observed that the truck had a flat tire, and the crew quickly made all efforts to manage the serious situation. Up to publication time the crew, pickup and chairs were still at the location; however, help was on the way to avoid a total flipping over of the truck and its material. I saw when it happened. The tire deflated first and then it caused the chairs to go off balance. The truck is not built to carry the amount of chairs it was carrying. LOL only in the good old BVI. I agree, only in the good old BVI. What if it had fell on another car or pedestrian? There was a number of road infractions going on and not one police officer in sight. Over loaded truck, load not properly secured, etc. big safety hazard and it was just luck that nobody was injured.